Are you a turnip lover? If so, you must try this delicious turnip curry recipe... !!! As we all know Turnips are creamy-white with a lovely purple, red or greenish or some time yellowish upper part where the taproot has been exposed to sunlight. They are a good source of vitamin C.
For a long time, it was also used as fodder for animals. And before the arrival of the potato, turnips were one of the main sources of sustenance for the filler food to human. Now, its widely used around the word and scientist have cultivated a large variety of it, available in different region. As Turnip is a common name for all types, but the type I have used is called Golden Turnips or orange Jelly Turnips or York Globe Turnips in different regions of the world. 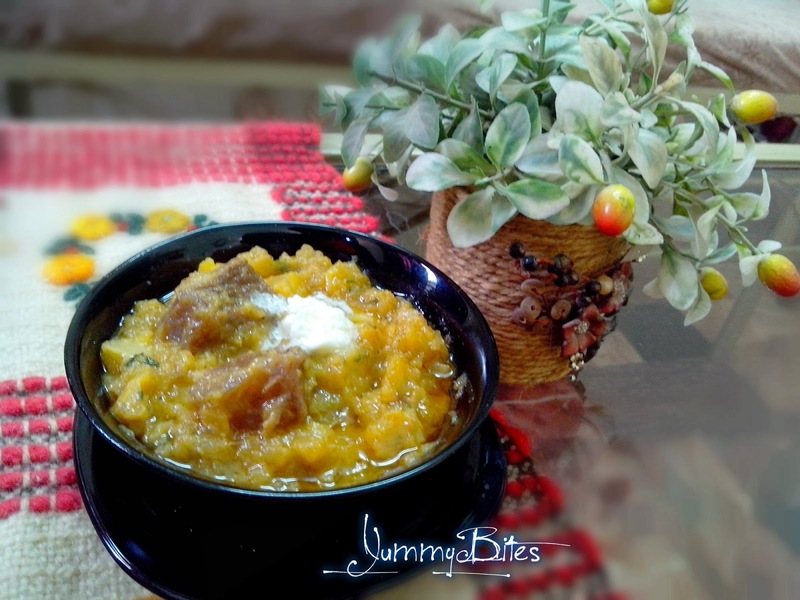 Turnips have pungent and peppery flavor that can be neutralized by adding a couple of tbsp of sugar or jaggery. It wont give an awkward flavor but will enhance the turnip tastes. The recipe I use to cook this pungent vegetable is very easy, only 4 main ingredients are enough with addition of some spices to make delicious curry. Normally, I cook food in pressure cooker because that's a time saving method, and turnips are tough vegetables that take too long if cooked in simmering process. Its better to use pressure cooker to have good curry to serve on time. Slice the turnips of 5cm thickness because it will define the curry texture. So, curry texture depends on personal likeness, I like it full mashy but if you want to have visible slices of turnips then cut thick slices. 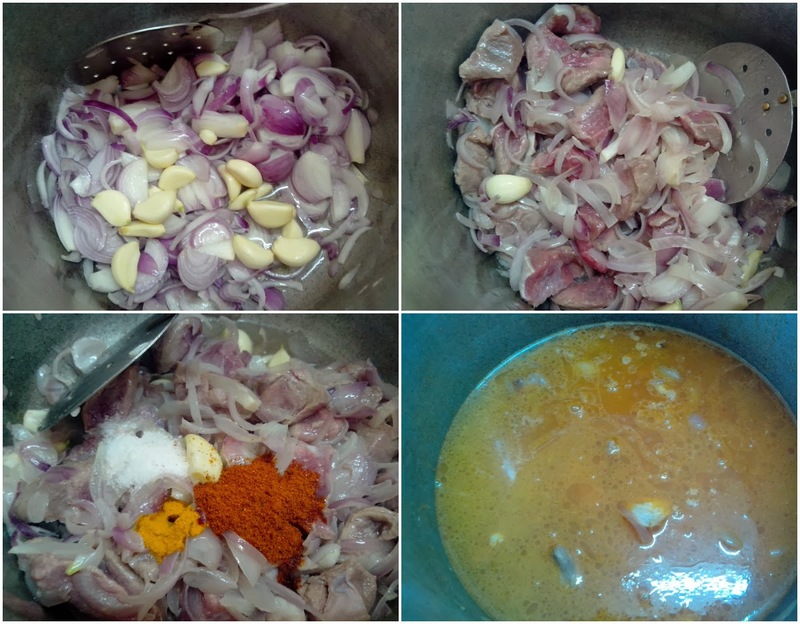 Cut the thin slices of onion, and meat will be preferred to cut in chunks. First, heat the oil in cooker, saute onion and garlic till onion become soft. Add meat and cook till meat turns its colour to pink. Add salt, red pepper, turmeric powder and 1/2 litter water and cook under pressure for about 15 minutes for fresh meat and for 10 minutes for frozen meat. Removing from pressure, water being cooked with meat, veges and spices have turned to tasty broth. Cook it on high flame that all water evaporate and curry is left behind. Add turnip slices, 2 tbsp of sugar and mix well, add 1/4 litter of water and let it cook in pressure again for 10 minutes. Remove from pressure add chopped coriander, garam masala and mix thoroughly. Cook it on low flame till oil appears on the side of curry. 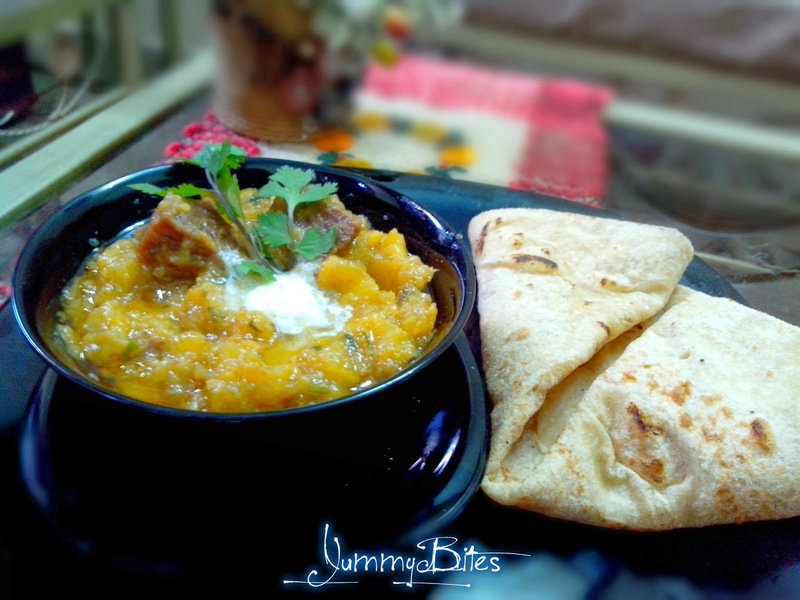 Serve it hot topped with a dollop of fresh butter and wheat roti.